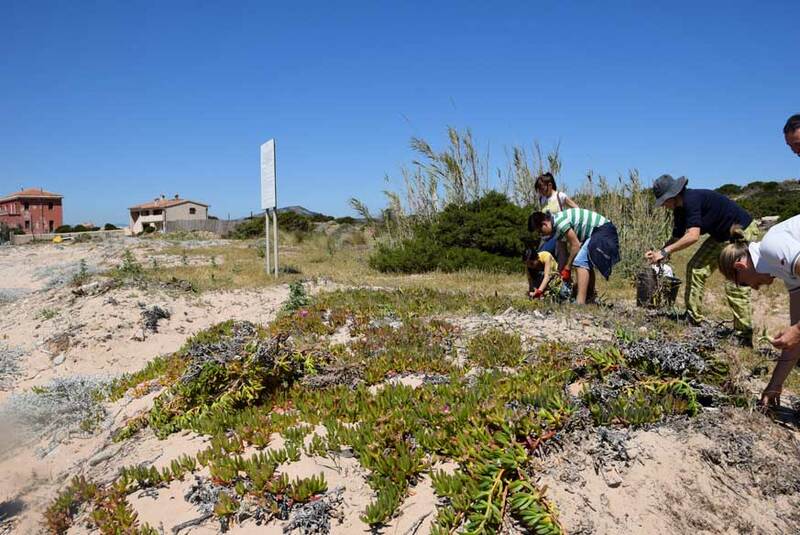 One of the goals of the LIFE Puffinus Tavolara project is to help make island ecosystems as natural as possible and to protect habitats and plant species of conservation interest, including through the eradication of Carpobrotus sp.pl. (Hottentot Fig) and any other alien plant species that may become invasive on Tavolara. The areas targeted for intervention mainly concern the island’s inhabited area, Spalmatore di Terra, which falls within the SCI ITB010010 “Isola di Tavolara, Molara e Molarotto” and SPA ITB013019 “Isole del Nord – Est tra Capo Ceraso e Stagno di San Teodoro”, and is included within the “Tavolara – Punta Capo Coda Cavallo” Marine Protected Area and is subject to hydro geological defence laws pursuant to R.D.L. n. 3267 of 30/12/1923. The Carpobrotus stands on the island of Tavolara targeted for eradication were identified by the Inter-departmental Centre for the Conservation and Promotion of Plant Biodiversity of the University of Sassari (CBV-UNISS) through field surveys carried out with the use of GPS (see Table 1). The presence of stands of Carpobrotus on Tavolara, as elsewhere in Sardinia and the Mediterranean, constitutes a serious threat to the conservation of many rare, endemic, and protected species typical of our beaches and of well-preserved coastal habitats. A total of 23 Carpobrotus stands were found, for a total surface area of 7,066 m2. Most stands were quite small, with an average surface area of 33 m2, except for one large stand of 6,342 m2 in a private garden. The dunes from where Carpobrotus was removed were re-colonized by typical native and endemic species worthy of protection, and which cannot effectively compete against this invasive species and thus tend to disappear, such as Rouya polygama (Directive 92/43/EEC). These positive effects have been observed and documented through a series of permanent monitoring plots at Spalmatore di Terra. In order to reduce the impact of eradication in the areas targeted, removal operations took place manually with the help of low-impact tools (such as rakes and cutting shears) by trained workers under the guidance of expert personnel, so as to ensure selective, well-controlled removal and to prevent native vegetation from being damaged, excessive sand removal, and the onset of wind erosion processes. Eradication consisted of the removal of all fresh Carpobrotus material both above and below the ground, including any seedlings, and to the extent possible, of the entire root apparatus and all dry material (leaf litter and dead branches, even if in an advanced state of decomposition). 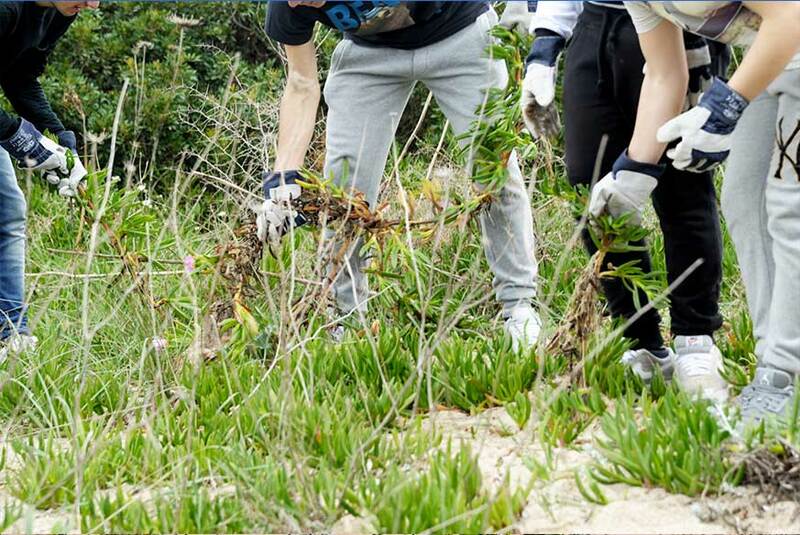 Any other discarded items (plastic or other waste) found in the leaf litter of near Carpobrotus plants were also removed, since they could contain seeds or fruits. The plants that were removed, together with the leaf litter and dead branches, were put into bags, sealed, and handled with care to prevent the risk of propagation of fragments. The plant waste was then temporarily stocked on tarps and left to dry and decompose before being incinerated. Indeed, since the amount of plant material that was eradicated was so large as to make transport to and disposal at authorized landfills difficult and very costly, it was incinerated on site with the authorisation of the Sardinian Forestry and Environmental Vigilance Corps. Eradication consisted of three separate campaigns, two of which have been completed, with a third scheduled to end in October 2018. 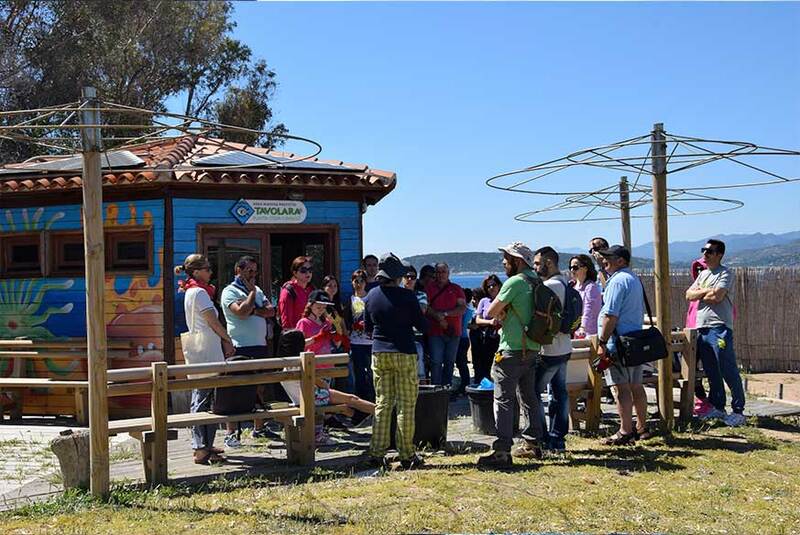 The first campaign concerned the removal of all Carpobrotus stands and the on-site incineration of plant waste. It consisted of 6 working days in 2016. 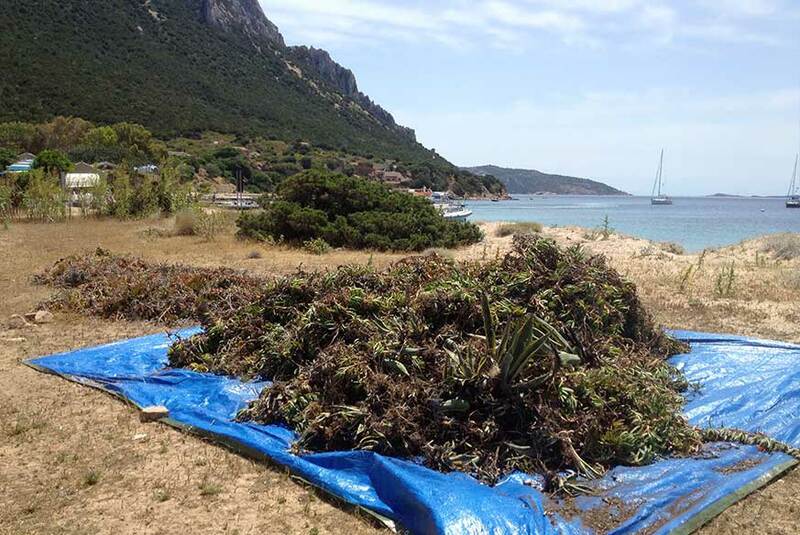 More specifically, on May 22 about fifty volunteers were involved in the operations in order to raise awareness on alien invasive species among the local population, while on the other days the work was carried out by the specialized company entrusted with removal, with the assistance of staff from the Marine Protected Area and the municipality of Olbia involved in the project. The interventions, which were scheduled to take place in fall and winter, and in any case no later than March (before the blossoming season) in order to avoid additional seed production, in some cases were actually protracted until the month of June, due to adverse weather conditions that made it difficult to reach the island. In 2017 a second eradication campaign took place, in which the interventions were replicated in order to identify and remove any seedlings that might have sprouted from the seed banks or from shoots. This campaign required two days of work. A third eradication campaign to identify and remove any new seedlings was launched on 29/05/2018 and will be completed in October 2018. 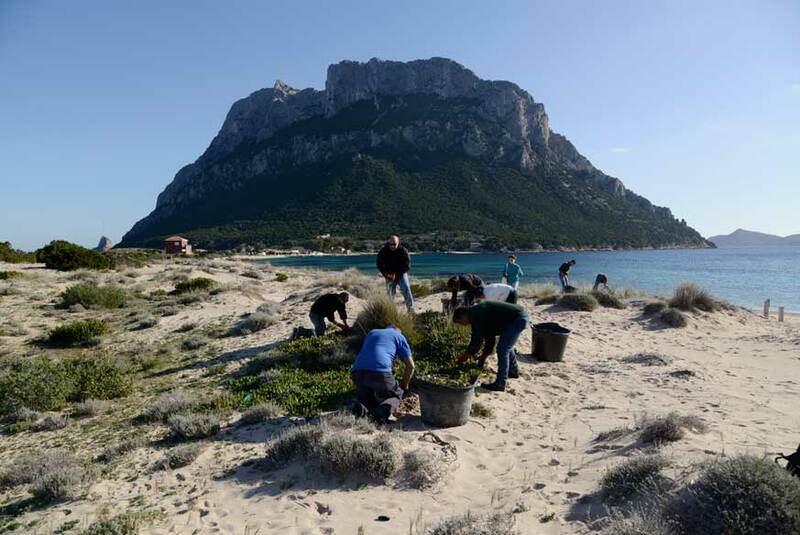 Through regular field surveys and by reporting any new seedlings – which are promptly removed – staff from the Inter-departmental Centre for the Conservation and Promotion of Plant Biodiversity of the University of Sassari (CBV-UNISS) are also assisting with the eradication effort.